Come stay with us and enjoy a "home away from home"... go golfing, watch the whales on the Cliff Path accross our Guest House, have a braai, enjoy great food and excellent local wines, read a book on the beach & make memories! Hermanus has lots to offer ! A local wine route with a number of estates producing some of the finest award winning wines in S.Africa. Of course the annual whale watching is a fantastic experience, tourist from around the world visit Hermanus between August & December just to experience this unique eco attraction. Besides this, Hermanus offers great beaches, many out door activities, great restaurants and a safe & friendly environment for young & old. - Adventure park with Paragliding, Kayaking,Quad tails, Scuba Diving, Paintball, Ziplines, etc. 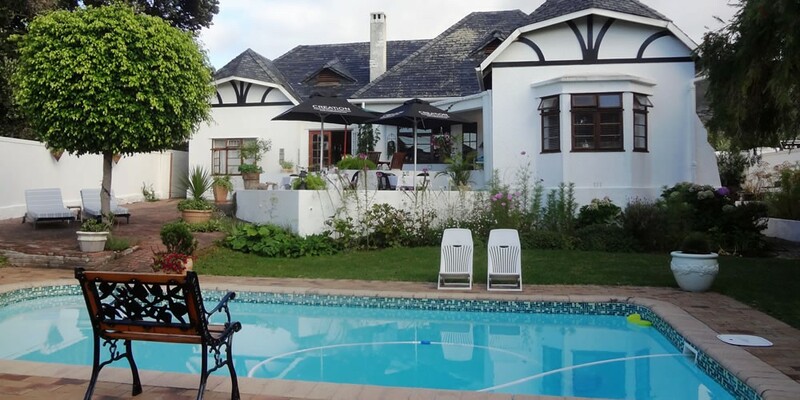 This well positioned guest house is situated in the prime area of Hermanus, across the road from the Walker Bay Cliffs whale walk and 200 meters from the popular 27 hole Hermanus Golf Course. only a few minutes drive to town and local beaches, offering value for money in a friendly & warm ambiance. Prices quoted are inclusive of breakfast. The establishment has a pool in the garden with braai / bbq facilities and a 2 course dinner is available for those who do not wish to eat out at one of the many excellent restaurants in Hermanus.